It’s been a bugger of a week in the kitchen. As of today, I have five failed English muffin recipes under my belt. Also, I no longer think my cousin is very sweet. In fact, I think she might be a little bit evil. She probably thought to herself, “She wants a project? Ha! I’ll give her THE MOTHER OF ALL PROJECTS! Let’s see how she handles this one!” and—ka-BAM!—she tossed me an idea and then sat back to watch the flour fly. Or maybe that’s just my tired, English muffin-overloaded brain running a-muck. At this point, I really have no idea. I have one more variation to try later on today and then I’m clean out of ideas. Which slays me. I’ve figured out how to duplicate a number of (what I thought were) unduplicable foods—bagels! baguettes! flour tortillas!—and so I was quite hopeful that I could conquer the English muffin. Because all my hard work was getting me nowhere, on Friday I decided to pour my energies into something more straightforward: braided bread. This egg bread is a piece of cake to make, looks fancy, and tastes delicious. Also, it has Easter written all over it. The recipe first entered our family about 25 years ago. My family had moved to Leadmine, West Virginia when I was ten, and while the culture was shockingly different from our previous life in Lancaster, Pennsylvania (no Mennonites in sight, no running water at the church, bears in the woods, etc), there was one family in particular that went out of their way to make us feel at home. Judy was one of the daughters, grown and with children of her own, and, if I’m remembering correctly, she had us over for dinner one Sunday afternoon and served us this bread. Judy’s family lived in an underground house. The front part stuck out from the side of the hill, but the back rooms were completely underground—it was strange and fabulous. Every time I went to their house I was reminded of the cow that stuck its foot through the roof of Laura Ingalls’ sod house. I kind of hoped that something similarly exotic would happen at Judy’s house, but it never did. Unless you count the braided bread. That was exotic and delicious. I thought it the most amazing bread ever and my mother must have, too, because she got the recipe and went on to serve it at a great number of our own company meals. Because of its fairly high sugar content, this bread gets dark quite quickly. Bake it on your best burn-proof baking sheet and cover it with foil if it gets too dark. In a large bowl, mix together the sugar, butter, salt, warm milk, and several cups of the flour. Stir in the dissolved yeast and the eggs. Add the remaining flour, a bit at a time, taking care not to add too much, until the dough is stiff enough to knead but still slightly sticky. Knead for five minutes until smooth. Set the dough in the floured bowl, cover, and let to rise until doubled. Divide the dough in half and cut each half into three equal parts. Shape each part into a long rope, about 15 inches long, or several inches longer than the baking pan. 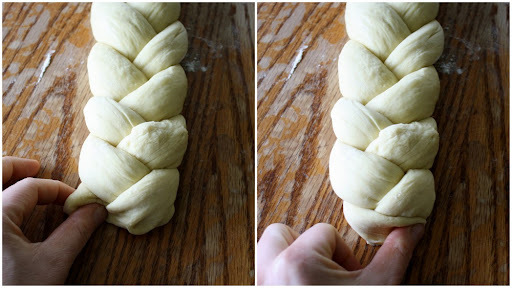 Lay three ropes side by side and braid them together, pinching the ends together and tucking them under the loaf. Repeat with the other three ropes. Lay the braids on greased baking sheets (I used two separate sheets but you may be able to fit them on one large one) that have been sprinkled with cornmeal. Cover and let rise for 30-60 minutes until puffy but not quite doubled. Immediately before baking, brush them with the egg wash (I use a paper napkin to dab on the glaze). Bake at 350 degrees for 25-35 minutes. This bread is best served warm. Tear off great hunks and slather with butter and jam. Leftovers make good French toast. Did you use an electric griddle with your english muffins? I used to make English muffins ALL the time but after this move I quit. The reason... none other than I got out of the habit. If you are interested in our recipe, just let me know and I'll pass it on. Honestly pretty much any bread recipe will work but our best muffins resulted when the dough was overkneaded and a bit wetter. There were also 2 rises... 1st rise (approximately 1 hr or until doubled), punch down rest 15 minutes, roll dough 3/8" thick. cut into 3" circles. dip both sides in cornmeal, cover & allow to rise 30-45 minutes. Cook on electric griddle/frying pan at 350 to 375F for about 8 minutes on each side. To serve. split muffins horizontally with the tines of a fork (never cut with a knife.... an actual paid professional breadbaker taught me that.) Hope this helps you! Because there is nothing like a fresh english muffin and they really are easy. Your braided bread sounds delicious! I think we may have to make some up this week since all the boys will be home. Thanks for sharing your recipe. Yes, Peggy, I'd like your recipe, please. Your cornmeal dipping method intrigues me. It appears you know what you're talking about. Oh no. My apologies. I really thought you could do it. I've only tried once and while they were okay fresh, the leftovers were ick. Shucks. I even menu planned for next week with Egg McMuffins set for Wednesday evening, hoping you'd have it figured out by then. Maybe I ought to get my fat belly in gear and try another recipe myself. Don't scratch the Egg McMuffins just yet. I may be on to something... (keep your fingers crossed). Who cares about English Muffins (sorry)..have that baby! I'm so excited I can barely see straight. I did not send this comment either. That man!! Mm, Karen, maybe you want to live at the house of Judy of the white bread, instead. Do you know what five failed English-muffin attempts means? Muffins THROWN at you. MUFFINSMUFFINSMUFFINS. You have to have Mountaineer's stomach to endure this. I want to know more about the custardy cheese spread, please. Also, I am so counting on you to figure out English muffins!!! No PRESSURE or anything. If I recall the ones that I made were just kind of blah. No nice crust or craters. I use your flour tortilla recipe all the time. But my bagels have been letting me down recently. . . hmmmm. I should look at your recipe. I don't have that book, but I'm interested in the recipe. I'll look into it. Thanks!